A 10 days holiday trip to UK sounds alluring! You must be oozing with excitement and can hardly wait to board the flight. Your luggage consists everything you need during the trip, but does the long list include tan international travel insurance policy? Chances are high that you didn’t bother spending for it as travel covers are not mandated in India as yet. But, you shouldn’t underrate the significance of travel policies especially in a foreign country like UK where standard of living is higher and medical treatments are costlier than India. Why Should You Opt For A Travel Insurance Cover? When you are armed with a travel insurance plan you are entitled to get a list of ad hoc expenses reimbursed. Here is a list of risks for which you can claim reimbursement. In case you come across any of the above-mentioned risks during your trip your insurer will pay you pack all the expenses you made once you come back to India. One of the main reasons of opting for travel plans is the medical coverage they offer. Cost of health-care is very high in countries like UK and if you fall sick you have to shell out a hefty amount in case you don’t have a protection. So what’s your take? Spending your hard-earned money for illness or availing cashless hospitalization facility through a travel cover? I am sure, you would go for the latter. Which Is The Best Travel Insurance Plan For You? Now that you have realized the importance of having a travel policy the only major task that remains is finding and buying the best travel insurance policy that will meet your needs perfectly. In India, there is no dearth of travel policies so you are better off comparing multiple plans in terms of premium, and coverage. The incurred claim ratio is also crucial as you don’t want to deal with a provider with poor claim settlement record. Here is a list of top 5 travel plans that suit your requirements. All the following travel policies are valid for a 10 days single trip to UK for an individual. The chosen location is worldwide and sum insured is $ 5 Lakhs. Picking The Best Travel Insurance Plan in Terms of Coverage Out of the 5 single trip travel plans mentioned above, the Travel Worldwide Platinum plan by Universal Sompo is the standout one in terms of all aspects such as premium, coverage, claim incurred ratio. The premium of this individual single trip travel plan is Rs.1344 and the provider boasts a high claim incurred ratio of 77.26% as well. Although, there is one other provider IFFCO TOKIO available with slightly better claim incurred ratio (77.66%) and the premium of IFFCO TOKIO travel cover is even lower(Rs.1040) but the coverage on offer is better with Travel Worldwide Platinum plan by Universal Sompo than the Gold 500 plan offered by IFFCO TOKIO. For the loss of passport and checked baggage you can claim up to $ 250 and $500 respectively. 3 out of 4 other plans including the IFFCO TOKIO plan provide $1000 for loss of checked baggage but you have to pay at least around Rs. 1000 more as lowest premium among those plans is Rs. 1438. By opting for this plan, you can further avail $1500 as advance cash for emergency situation. You will get the same coverage from Titanium plan by HDFC ERGO but by paying additional premium ( Rs.1438). So coverage-wise, Travel Worldwide Platinum plan by Universal Sompo is your best bet. The plan also comes with second-lowest premium and the provider boasts second-highest incurred claim ratio after IFFCO TOKIO. Top 5 Travel Insurance Policies For Frequent Travelers The earlier list of best 5 travel insurance plans are meant for single trips only. But, if you travel 4-5 times in a year, you should rather go for an annual multi-trip travel policy. Although, business people usually choose this type of travel plans but of late individuals are also going for multiple leisure trips in a year. Hence, multi-trip plans are gaining momentum as they are more cost-effective than single trip policies. Let’s take a look at the top 5 travel insurance plans in 2016 for those who make multiple trips in a year. Assuming the total duration of your trip is 45 days (5 trips in a year with 9 days duration for each trip). $1,000 with limit of 50% for each bag & 10% for each Item of Sum Insured. Sorting The Best Multi-Trip Travel Cover Out Among the top 5 multi-trip travel policies, the Corporate Elite plan by Reliance is the best one. By availing this plan, you will get maximum compensation for loss of checked baggage ($1500.00) and passport ($300). No other plan on the list would provide you the such coverage. The Reliance Corporate Elite plan also offer $1000 as advance cash for emergency situation. Only the Travel Guard Platinum plan by Tata AIG offer $500 more cash ($1500) but the plan offers less for loss of checked baggage and passport. In a nutshell, Corporate Elite plan by Reliance would be your best pick. Although, the premium is a bit on the higher side but the plan surpasses other multi-trip travel policies in terms of coverage and claim incurred ratio (90.45%). Top 5 Travel Insurance Policies For Couples While solo traveling is fun, holidaying with your spouse or family is no less exciting as well. Regardless of whether you want to set out with your partner or whole family there is a travel plan for every situation. Let’s go through top 5 family travel insurance covers for 2 persons for a sum insured of $50,000. The chosen geographical area is worldwide(excluding USA and Canada) and the trip duration is 10 days. Out of these 5 above-mentioned family travel insurance plans , the Family Standard plan by Reliance is the standout one. The plan comes with lowest premium amount of Rs. 1031 and offers best coverage for loss of baggage($500). The policy also provides $300 as compensation for loss of passport. Although this coverage is available with two other travel plans on the list but no plan except Family Standard plan by Reliance offer advance cash of $500. This feature along with best incurred claim ratio makes this plan as the best family travel cover for you and your spouse. Conclusion: Now you are all set for your vacations. If you resort a travel insurance plan , you can spend your holiday with complete peace of mind be it a solo trip or with your loved one. If you opt for multiple trips in a year, travel covers are available to provide you with financial protection as well. 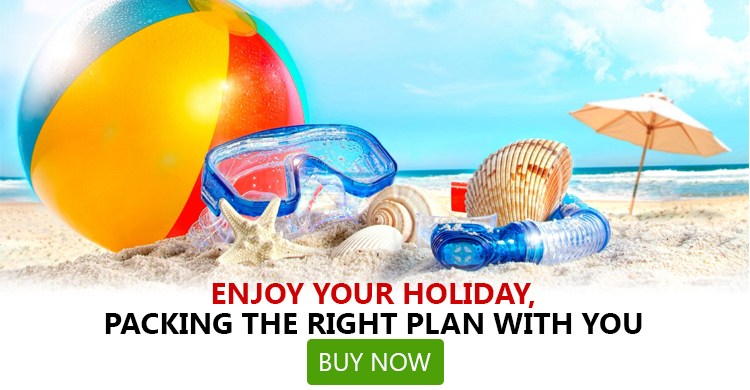 The right way to find the best travel insurance policy in 2016 in India is comparison. You need to compare policies on the basis of coverage on offer for various situations, toll-free number, payment options and claim process and settle with the plan that meets your need. The top travel plans that are mentioned here fared well in 2015 and are sure to create a buzz in 2016 as well. If you want to own any of these travel covers you can visit GIBL.IN and make an informed and instant purchase.